ICPSR Summer Program: Save the Date! 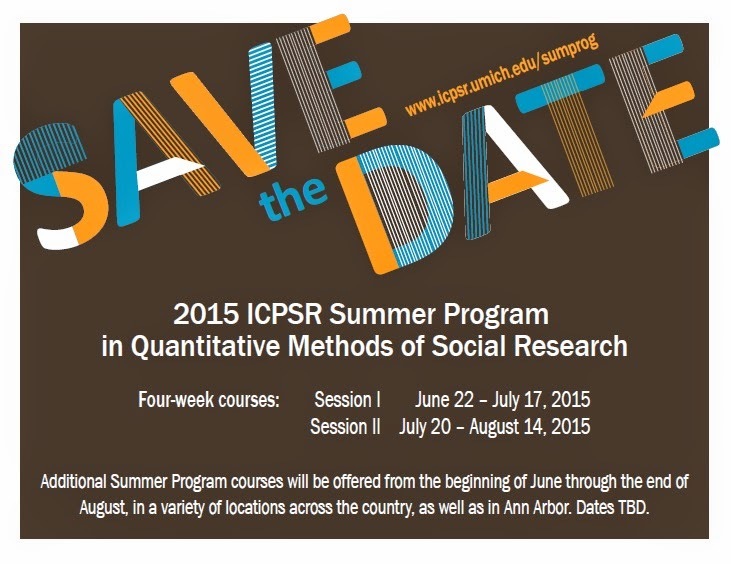 Announcing the 2015 ICPSR Summer Program! Save the Date! Announcing the 2015 ICPSR Summer Program! Courses offered in Sessions I and II are held in Ann Arbor, Michigan. You can view the full list of four-week courses here. Additionally, we will offer many 3- to 5-day workshops in Ann Arbor and other locations across the country. These short workshops will be held from early June 2015 through mid-August 2015. For a list of these 3- to 5-day workshops, please check back in late January 2015. Official registration for all 2015 ICPSR Summer Program courses will open Monday, February 2, 2015.